Akhavan, Z. (2014). Using Inoculants to Obtain Proper Source of Soil. International Journal of Advanced Biological and Biomedical Research, 2(4), 1023-1029. Zarnegar Akhavan. "Using Inoculants to Obtain Proper Source of Soil". 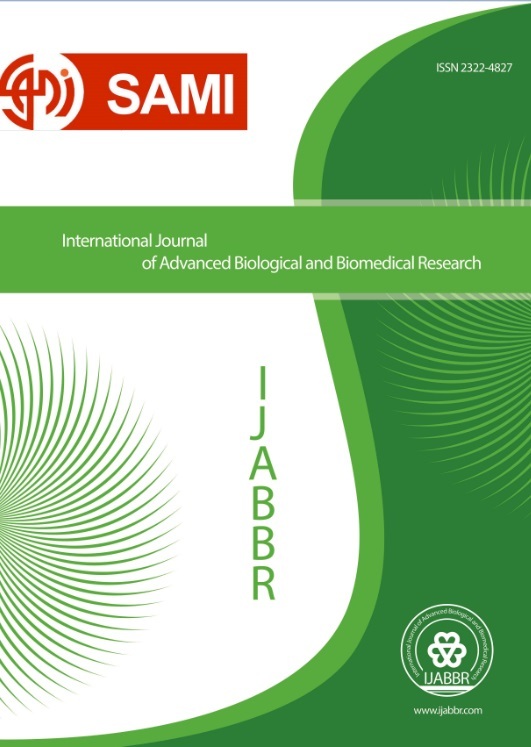 International Journal of Advanced Biological and Biomedical Research, 2, 4, 2014, 1023-1029. Akhavan, Z. (2014). 'Using Inoculants to Obtain Proper Source of Soil', International Journal of Advanced Biological and Biomedical Research, 2(4), pp. 1023-1029. Akhavan, Z. Using Inoculants to Obtain Proper Source of Soil. International Journal of Advanced Biological and Biomedical Research, 2014; 2(4): 1023-1029. The nutrient elements uptake in many of soils, is a problem because of high pH and plenty of calcium ions in them. Some of these elements are phosphorus and microelements. It is possible to increase absorption of these nutrient elements by addition of sulfur in soil and biological oxidation. The rate of this reaction is very slow and Thiobacillus bacteria are the most important oxidators of sulfur in soil. Inoculation of soil with this bacteria results to increase rate of sulfur oxidation, so sulfur utilization with this bacteria in alkaline and calcareous soils will be useful. In order to consider the effect of sulfur and Thiobacillus inoculant on soil pH decreasing and increasing in ability of phosphorus and microelements absorption, a greenhouse experiment was carried in Azad University of Karaj, in factorial form and Randomized Complete Block Design (RCBD) with 15 treatments containg 5 levels of elemental sulfur (200, 400, 600, 800, 1000kg/ha) and 3 level of inoculants (without, 5 & 10 gram with 107 bacteria per gram) in 3 replications in 2010-2011. After seven months shoots of plant were cut. Soil samples were analyzed to measure availability of elements. The results indicated that there was significant difference between treatments in viewpoint of phosphorus and microelements absorption in level of 1%. Amount of available Fe, Zn, Mn and P significantly increased and soil pH decreased 1.05 unite compared with primeval soil, this decreasing was significant in level of 1%.